Our original worship space, Ronnenkamp Hall, was brought to the site from Camp Adair where it had been an Army chapel. 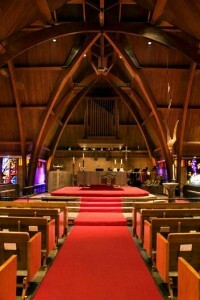 That space is now a multipurpose center and retains a small chapel. 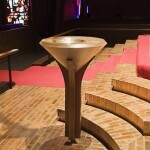 The current Sanctuary was completed in 1967 with the basic footprint as of a cross. The free­standing altar, with worshipers seated on all sides expresses in design the nature of Christian worship. We are a part of the family of God gathered about the altar (symbol of the meeting place between God and man) for worship centered in word and sacrament.The design should assist us to be participants together with fellow Christians in the act of worship. 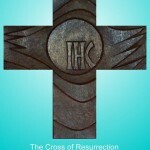 The crosses on the frontal (face of the altar) represent in symbols highlights in the life of Christ. 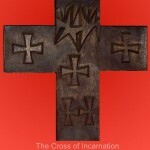 The west-­side cross is the Cross of Incarnation, the angel figures reminding of annunciation and the stars reminding of the light by which the wise men and shepherds were guided to Bethlehem. 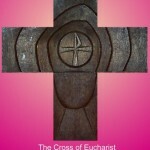 The cross on the south side is the Cross of Eucharist, the symbols of bread and cup reminding of Christ’s body and blood given and shed for the remission of sins. The cross on the east side is the Cross of Crucifixion, its crosses, crown and nails symbols of the suffering king, and greek letters alpha and omega reminding that Christ is the beginning and finisher of our faith. 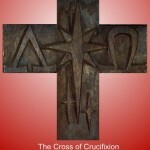 The cross on the north side is the Cross of Resurrection, the stone rolled away. Designing and producing these crosses was Ernst Schwidder, Chairman of th e Art Department, Pacific Lutheran University, Tacoma, Washington. 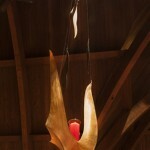 The symbol of the Descending Dove suspended over the baptismal font reminds us of the witness at Jesus’ baptism. The dove is a symbol of God the Holy Spirit. The works suspended above the dove are symbols of the “fruits of the Spirit” (love, joy, peace, patience, kindness, faithfulness and goodness). The artist designing was Mr. Schwidder. The artist producing the design was Mr. M. E. Knutsen, of Tacoma, Washington.